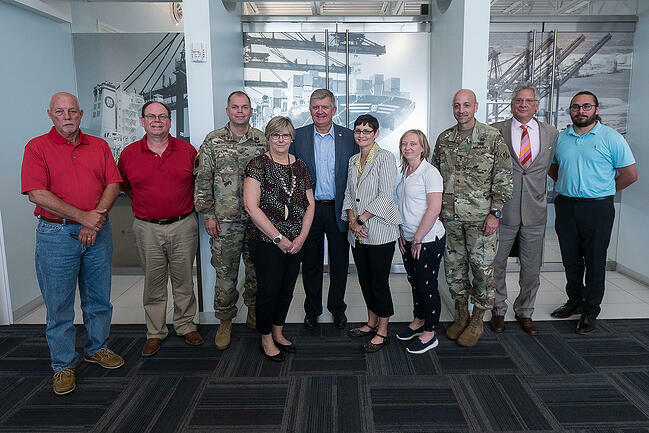 The Major General and Corps representatives met with Port Houston Executive Director Roger Guenther and Channel Development Director Mark Vincent, who discussed the Houston Ship Channel, project economics and Hurricane Harvey impacts. Port Houston is partnering with the U.S. Army Corps of Engineers on a mega-study evaluating the feasibility of modifying the Houston Ship Channel, including widening and deepening of the waterway and other improvements. Houston’s energy, security and infrastructure makes the channel one-of-a-kind with more than 190 public and private facilities along it. “Shoaling on the Houston Ship Channel impacts not only shipping, marine operations and navigation, but it also affects our stakeholders, American consumers and the economy,” said Vincent. Port Houston works closely with the U.S. Army Corps of Engineers to facilitate commerce and maintain navigation of the channel. Sediment control is of significance for resiliency efforts in light of future storm and flood events.